▲2. The parcel does not include the bulb, and our light socket is universal, you can buy it in your near shop. ZEEFO new generation energy-saving Desk Lamps comes with friendly vision, low power consumption light source, fit for home and office. This Simple designed. This Simple designed, Japanese-style looking and energy-efficient light perfect for illuminating / sleeping. It creates a sweet romance atmosphere.. 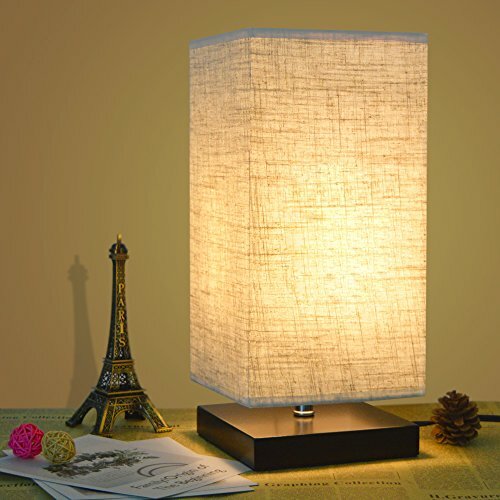 Whether in a child's room, near the television computer or in your office, the lamp, sitting on its square wood base to provides a natural touch. The soft, stable, and non-flickering light is friendly to the eyes, so you can enjoy what you're doing for longer. We care about eye care. Fabric shade, Wood stand, Standard carton and foam for each piece, to make sure the products safe and complete when you receiving. 1 Year Replacement Warranty. Any doubts, please kindly contact us. We will provide good service. Minimalist Japanese-style tatami Desk Lamp Perfects for living room, bedroom, office, kids room, or college dorm，it will bring you a peaceful and warm night.